A luxury extension that fitted both house and budget like a glove. 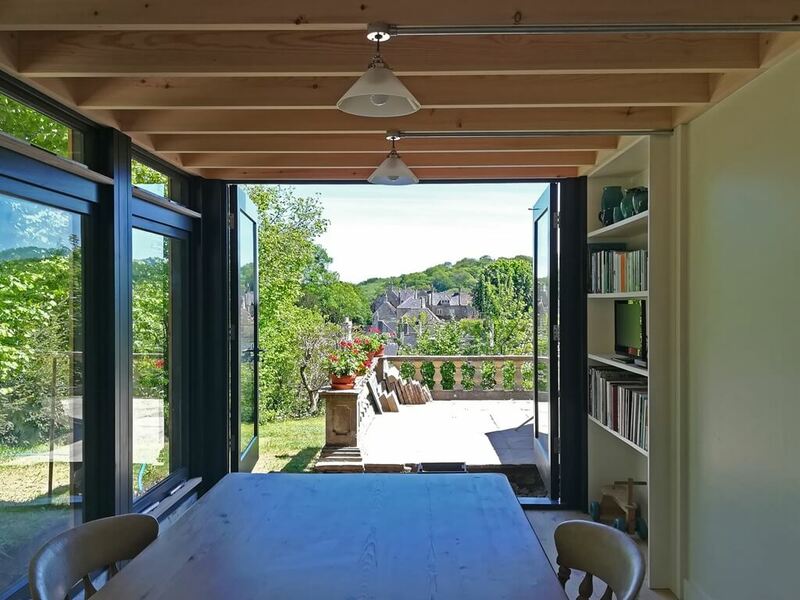 This relatively small extension, of only 14 m2, has made a significant difference to the kitchen and dining area of our clients’ house; they are thrilled with the transformation of their home. They even said that they loved having our team around so much that they were a little sad to see us leave – considering they were dreading having workmen around, that’s a wonderful result! 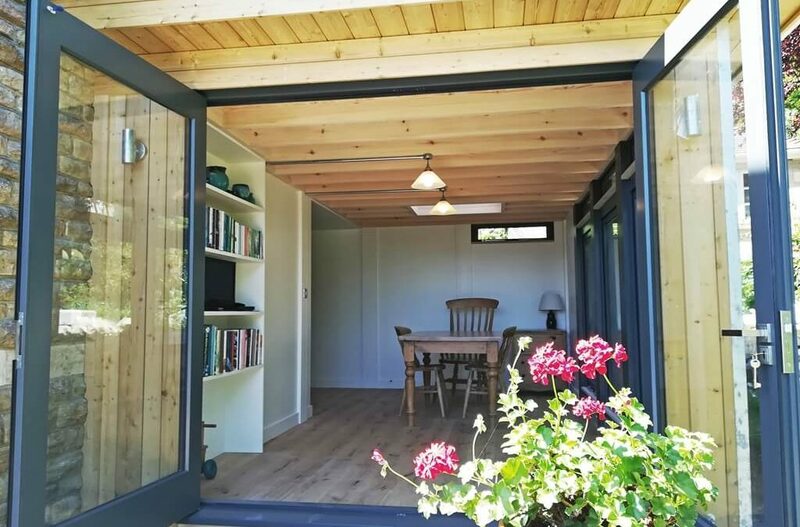 The costs involved in traditional building construction can be daunting, particularly when you just need a small amount of extra space for a home extension or a garden room. 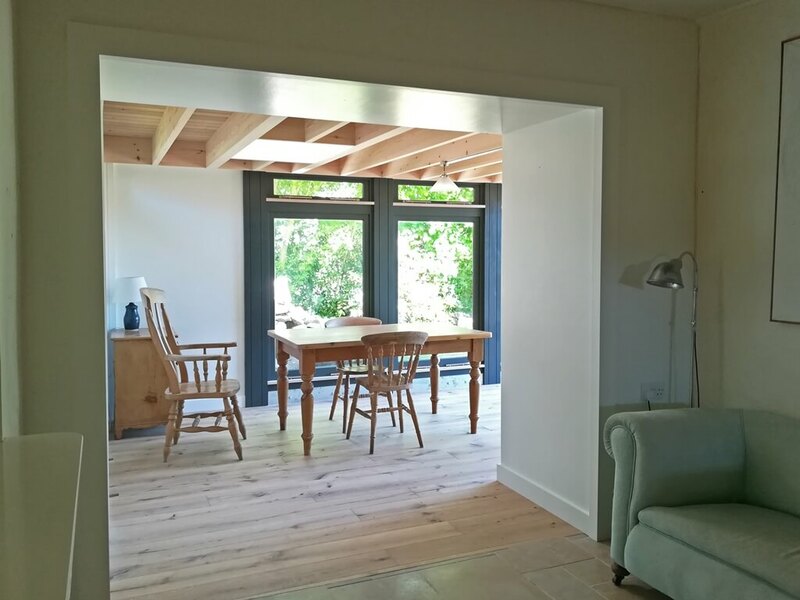 Our clients, living in a village just south of Bath in a stunning Wiltshire valley, had plans to extend their cramped, dark kitchen and dining area but were struggling to find the right solution. They spent months sourcing designs and quotes from local architects and saw their budget thrown out the window as the fees associated with traditional construction mounted. Our clients have spent years making their beautiful Bath Stone family home just right and this development was the last element to be considered. They wanted to make the kitchen and dining space link with the rest of their home and maximise the light on the North-East facing side of the house. But it was a daunting prospect; the amount of services running down the back of the house, including electrics, soil pipes and drainage had been an ongoing concern and they felt they would be restricted to using certain traditional (and expensive!) materials, given that their village falls within a Conservation Area and AONB. When they saw their neighbours having a MOSSpod extension installed, they were very interested. After visiting, and hearing how easy and enjoyable the process had been for them, they realised that they could also have a stunning home extension for a price they could afford and so they got in touch with us at MOSS. After an initial meeting they chose a Park Range MOSSpod to match the traditional character of their Bath stone property. Due to its location, their extension did require planning permission, but given the sympathetic nature of our MOSSpod designs and high quality materials proposed, the plans sailed through. What’s more, the complexity of reorganising the services feeding the back of the house wasn’t an issue at all. Our pods are carefully composed to overcome challenges that may seem impossible – they’re adaptable for almost any space. Their new MOSSpod now nestles on the side of the house, soaking in light through the floor to ceiling windows and an elegant skylight pooling natural light onto the dining table below – perfect for reading the paper over a cup of coffee in the morning. The extension knock-through means that the tiled kitchen floor now transitions beautifully into the MOSSpod’s velvety engineered oak floorboards opening the space up into an inviting kitchen/dining area. Our clients relish everything about their new home extension and have said that it’s the little details of our design that make it really special, from the recessed shelves set for favourite cookery books and much loved pottery to the galvanised steel light fittings.